MackieMade Paper Creations: 25 Days of Christmas at Paper Sweeties! 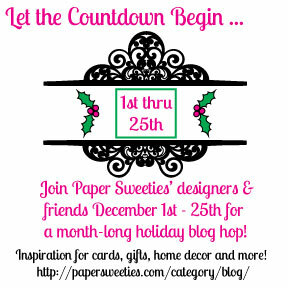 25 Days of Christmas at Paper Sweeties! Each day this month, a different designer will post a card or project featuring PAPER SWEETIES products! We did this last year and it was a blast! Our PAPER SWEETIES Design team will post the first 15 days of the month, and then we will have some VERY special guests posting at the end of the month! So I hope you will visit the PAPER SWEETIES blog each day for some fabulous inspiration and lots of prizes! Now I will share my card! I decided to feature Miss Emma today! Doesn't she look cute in her Christmas outfit? Her outfit is from the Have a Holly Jolly Holiday stamp set. I paper pieced the clothes and used Copic Markers to color her skin and hair. The pretty Christmas lights are from the current release Basket Add-On: Baked with Love. I colored the lights with Copics and then added Glossy Accents to the little bulbs. The sentiment on the sign is also from the Have a Holly Jolly Holiday. The little sign is from the Garden Time Sweet Cuts set. It was perfect for my little snow scene! Now please visit the Paper Sweeties Blog each day in December for some awesome inspiration!!! Oh my lordy be, Mackie! I can hardly stand how CUTE this card is! You have Emma dressed in one of my favorite outfits ... this card is AMAZING -- just like YOU! Love your darling card. Emma is so cute and kaft is my favorite background "color". What a sweet card with Emma and the string of lights!! Love her outfit and awesome coloring...so CUTE!! Oh gosh is this ever CUTE!! I love her sweet outfit. Another delightful card Mackie!! Miss Emma looks adorable in her Christmas outfit. Gorgeous card, love the string of lights!